The temple was constructed 125 years ago by the merchant community from Gujarat and was subsequently renovated in 1999. PM Modi met with the temple administration officials in Muscat. 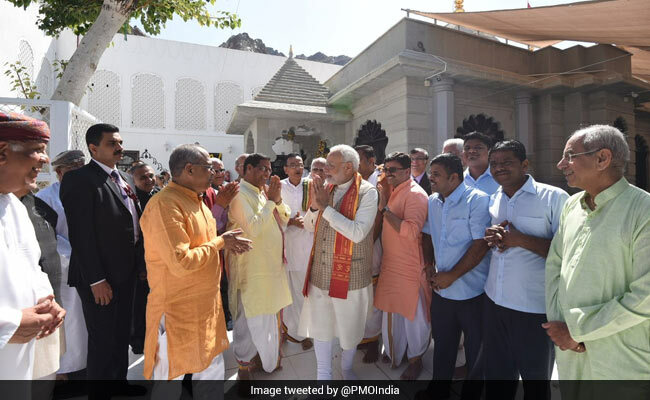 Muscat: Prime Minister Narendra Modi today visited a 125-year-old Shiva Temple in Muscat, one of the oldest in the region, and offered prayers. The temple has three deities -- Shri Adi Motishwar Mahadev, Shri Motishwar Mahadev and Shri Hanumanji. During auspicious days more than 15,000 devotees visit the temple for prayers. The prime minister also posed for group photos with the temple administration officials and the Indian community members.